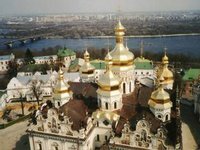 A separately-standing two-storey building in the territory of the Kyiv Pecherska Lavra [monastery] caught fire in the afternoon of January 14, with 200 square meters of its area affected by fire, a statement published on the website of the State Emergencies Service of Ukraine has said. According to the statement, the building on fire is located at 23 Lavrska Street and belongs to the monastery complex of the Kyiv Pechersk Lavra. The 101 emergencies line received a call about the fire at 4.17 p.m. According to initial reports, the fire started in one of the rooms located on the first floor and then expanded to the roof of the building. At present, about 200 square meters of the building is on fire. As of 5.30 p.m., the firefighters had to withdraw from the building to a safe distance because of the threat of the collapse of the ceiling slab between the ground and first floors. They are trying to extinguish the fire from the outside. Some 11 firefighting vehicles and more than 40 personnel are working on the scene to put the fire out.